I was lucky enough to get a last minute seat upgrade just a few rows back from the stage in the center of the Orpheum Theater for their show in Los Angeles. As the show progressed, I felt myself being transported back to my first concert ever, seeing an earlier version of this band at the age of 15. Then I remembered why I love this music so much – Because it’s timeless! They sounded amazing! And that’s not just thanks to the advances in technology, but to their musicianship as well. 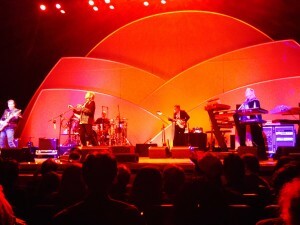 The band was incredibly tight and Jon Anderson’s voice was spot-on! And despite being diagnosed with pneumonia earlier that week, Trevor Rabin delivered without even a hint that he was ill. (Music heals I suppose?) Of course, Rick Wakeman is one of the best keyboard players of all time … so there’s that. New member Lee Pomeroy on bass has an intriguing inverted south-paw style that is fascinating to watch, and Louis Molino III on drums was the perfect blend of both Bruford and White’s styles and dynamics. The show started off with the short but sweet instrumental, “Cinema” which is the lead-off track to their “90125” album and an appropriate way to start the show for this lineup. 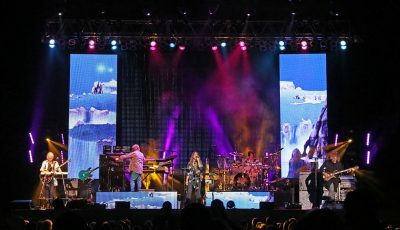 The band alternated between that project and classics such as “Perpetual Change”, “Hold On”, “Your Move/All Good People”, “Changes”, “And You And I”, “Fragile” favorites that included “Heart Of The Sunrise”, “The Fish” and “Long Distance Runaround”, along with “The Rhythm Of Love” from “The Big Generator” album, and “Lift Me Up” from “Union”. At one point, Jon Anderson and Rick Wakeman took the stage together for a subtle version of “The Meeting” from the ABWH era. Then they wrapped up the set with the 22 minute epic “Awaken” which features Wakeman’s distinctive piano intro and a mid-section with Anderson on harp. 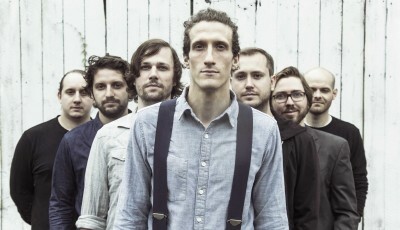 This song always seems to be a centerpiece of their shows as it floats through the circle of fifths, and lands on distinctive cues where everyone meets up briefly before departing again. Like most Yes fans, I always considered this to be one of my favorite headphone tracks. After a brief break, the band returned to play “Owner Of A Lonely Heart” for their encore, featuring Trevor’s son Ryan on drums from the band Grouplove. At the end of the song, Trevor and Rick ran out into the audience for some great guitar and keytar call and response. Then Molino returned on “Roundabout” to finish off a perfect evening of music. Of course, it’s difficult to write about this band when you can’t technically call them “Yes”, but this is the heart and soul of that band that has seen so many personnel changes over the decades. Yes had previously split off into two factions back in the ’90s as well with the formation of Anderson, Bruford, Wakeman & Howe, then reuniting with their namesake for the “Union” album and tour. There are once again two lineups touring the world now and both are deserving of our praise as I’ve written before in my previous reviews. As Jon Anderson introduced “Heart Of The Sunrise”, he mentioned that not a day goes by where he doesn’t think about recently departed Yes founder and bass player Chris Squire. One can only imagine what the behind-the-scenes dealings are between all these musicians, but it doesn’t really matter as the music always seems to bring them back together again. We’ll look forward to hearing some more timeless music from ARW which they plan on recording in early 2017, and hopefully they’re return to the U.S. after their European tour in the spring. *Special thanks to Marc Goodman who contributed to this article. An Interview With The Denver-Based Homegrown Record Label, MADE IN THE SHADE RECORDS! As The Creators Of Crowdfunding and 17 Albums Under Their Belt, MARILLION Have Plenty To Share!